We love helping athletes achieve their best. Through our range of top-quality wheelchair and adaptive sport technologies, we ensure our sponsored athletes have the equipment they need to do just that. 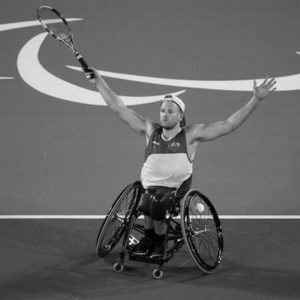 Dylan Alcott OAM, is one of Australia’s most successful and well recognized Paralympians, motivational speakers and media personality’s.At the 2016 Rio Paralympics Games, Dylan became a 3 x Paralympic gold medalist, and one of only a few athletes to win two gold medals in two different sports across two different games. At the age of 17, Dylan became the youngest ever wheelchair basketball gold medallist at the 2008 Paralympic Games in Beijing. After gold at the 2010 world championship, and selection in the world all-star 5, he and his team, ‘The Rollers’ won silver at the London Paralympic Games.In late 2013, Dylan decided to switch sports to wheelchair tennis, where he has gone on the win 3 Grand Slam titles (2 x Australian Open, 1 x US Open) and won gold medals in both the wheelchair tennis singles and doubles competitions at the 2016 Rio Paralympic Games. Born with a tumour wrapped around his spinal cord, Dylan survived a three-year battle to live and has been achieving ever since.He is honoured to have received a medal of the Order of Australia in 2009 at the age of 18. He is also a keen philanthropist, and in 2014 set the world record for the longest continuous playing of wheelchair tennis, playing for 24 hours nonstop,raising funds for two charities he is an ambassador for, Variety the Children’s Charity and The Starlight Foundation. Dylan is also an outstanding motivational speaker, traveling Australia and the world inspiring organisations to be better,and has a passion for promoting inclusion and diversity for people with a disability around the world.He has completed a bachelor of Commerce from Melbourne University, rapped on stage with the Wu Tang Clan and has also set a trend for wheelchair crowd-surfing at Australia’s biggest music festivals. 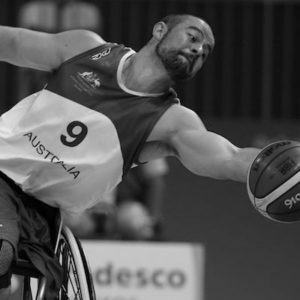 Australian wheelchair basketball player Tristan Knowles started playing wheelchair basketball after loosing his left leg to cancer at age 9. Making his Paralympic debut in 2004, Tristan helped the team secure the silver medal, and since has built an impressive list of achievements.These include four Paralympic games and three medals, three world championship medals as well as a number of National and European Club Championships. In 2009 Tristan was awarded a medal of the Order of Australia for service to sport as a Gold Medallist at the Beijing 2008 Paralympic Games. For more information on Tristan visit the Australian Paralympic Committee website. Wheelchair rugby player Ben took up the sport at the age of 18 after becoming a quadriplegic in an unfortunate snowboarding accident. Before the accident Ben lived for action sports including snowboarding, wakeboarding and surfing. 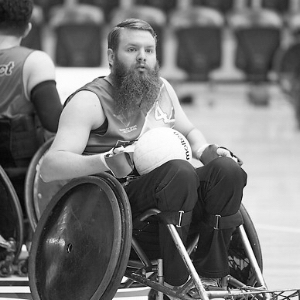 Wanting to again feel the adrenaline that comes from pushing your body to its physical limits, Ben took up wheelchair rugby after 6 tough months of rehabilitation. In 2012 he was named Australian rookie of the year, and although Ben’s still to compete in his first Paralympic games, he’s highly motivated to compete at the highest level of the sport. For more information on Ben visit the Australian Paralympic Committee website.